Michael Amoky and Artists of Houston Ballet Academy performing as French waiters in Stanton Welch’s The Nutcracker, Dec. 10-23 at Smart Financial Centre in Sugar Land, and Dec. 30-Jan. 6 at the Hobby Center for the Performing Arts. 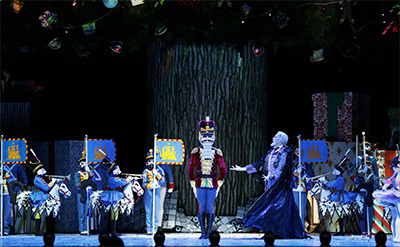 Artists of Houston Ballet in Stanton Welch’s The Nutcracker. Stanton Welch framed his new Nutcracker as a coming-of-age story, with a young Clara at the center of his dazzling holiday ballet, now entering its second year. With that choice come dancers of all ages, including more than 100 Houston Ballet Academy students, some dancing on stage for the first time, others on the threshold of a professional career. 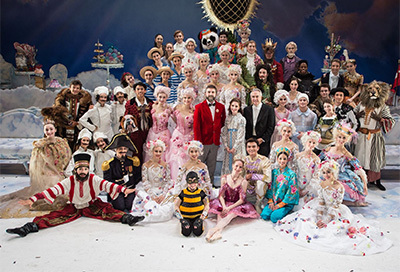 This holiday there are two separate venues to see all those talented young dancers in action as Houston Ballet’s production of The Nutcracker has a double run, Dec. 10-23 at Smart Financial Centre in Sugar Land, and Dec. 30-Jan. 6 at the Hobby Center for the Performing Arts. Traditionally, young dancers are a staple of Nutcracker productions, mostly in minor or decorative parts. 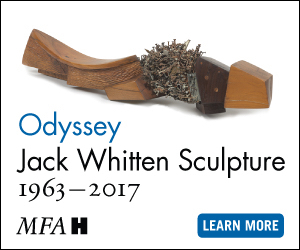 But that would not do for Welch, who dared to give Houston Ballet’s tiniest talent some standout roles—a decision that was met with praise by both fans and critics alike. 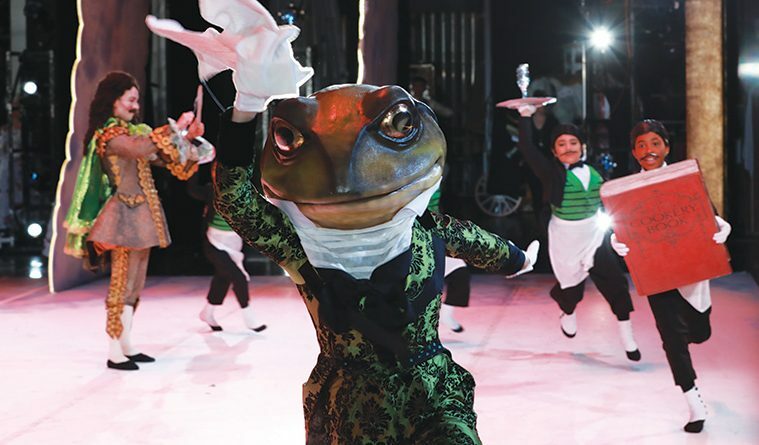 Audiences will be delighted to find young dancers in surprising appearances as a polar bear guard or frog ambassador. Welch knew early on that, in order to make his ballet truly fantastical, he would need an army of dancing children. 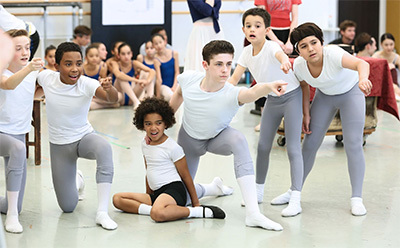 “Stanton Welch likes to involve more kids, so they are in almost all of the acts,” relays 13-year-old Michael Amoky, who has been performing in Houston Ballet’s Nutcracker since 2011 and, like others involved, understands the importance of his role in the production. Michael Amoky and Artists of Houston Ballet Academy. The same goes for Mary Clare Pincu, who performed as one of the adorable bumblebees last season. Her older sister Mattie had performed in three Nutcrackers, first as a party child, then a clown, and last year as the Chinese Doll. 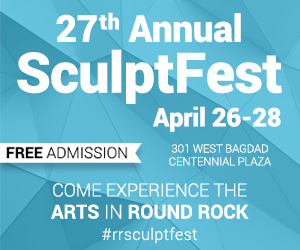 “I loved watching my sister in the ballet and dreamed of the day that I would finally get a chance to dance on stage with Houston Ballet just like her,” says Pincu, who also performed as a scraggy samurai rat. At age nine, Pincu already has one Welch world premiere on her résumé. 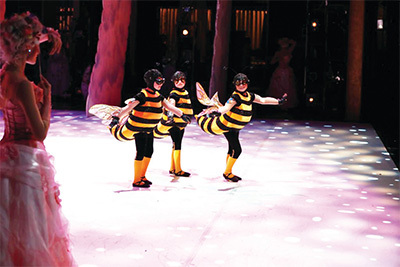 Mary Clare Pincu and Artists of Houston Ballet Academy performing as bumblebees. Even still, performing in these elaborate costumes is a factor these young dancers handle with professional prowess. “When you’re dancing, the costumes can get really itchy once you start to sweat, while other times buttons might pop off and you just have to pretend like nothing happened,” explains Amoky. Reprinted with permission from the Houston Ballet Program Magazine.